Yet, if we are honest, our nation abandoned the most fundamental American value and human right a long time ago – the right to be born. If you want to understand our increasingly polarized and toxic political atmosphere, you need to go back to 1973. The legalization of abortion in the 1973 Roe V Wade Supreme Court decision was a moral, religious and psychological earthquake. We still do not understand the full extent of how the shockwaves of this event have fractured our people, and the entire nation. Have you noticed lately that many on the left/liberal side of politics, such as Senator Schumer, seem to be experiencing a type of collective hysteria and nervous breakdown? With each move by the Trump administration, its 1939 once again and Hitler is about to invade Poland. There may be an abortion connection. We have had generations of our nation’s children educated and formed by teachers, music and entertainment figures, college professors and counselors (and led by politicians) who are morally and spiritually compromised in various ways by abortion. Others have also been similarly impacted by their involvement in immoral sexual behavior and relationships. Complicit by advocating for the abortion in the decision making process – paying for an abortion – or in various ways helping to facilitate a women’s access to the procedure. Abortion denial can lead to the misdirection of the emotional and spiritual energy that should go toward repentance, healthy grieving and healing – into abortion rights activism. This is manifest in the promotion of sexual immorality and abortion rights in our primary and secondary educational system, among medical and mental health professionals, in corporations, the entertainment/media industry, and even among some of our religious leaders. Without emotional and spiritual healing, over time these abortion rights and sexual revolutionary activists, and their many disciples, become increasingly reactive, intolerant and aggressive when confronting any perceived threat to their agenda. They pursue their utopian vision with a righteous religious zeal as they label all opponents as hateful and fascist reincarnations of Adolf Hitler. This in turn increases the antagonism, mistrust and polarization between opposing groups. Because honest and civil dialog are impossible with the reactionary left, various groups retreat to their own echo chambers for comfort, community and a reinforcement of core beliefs. There are other contributing economic and social factors for the current state of our nation. But the toxic divisions in our society are magnified and exacerbated by the national denial of our shared abortion wounds, and the failure to repent, grieve and heal of our complicity in the death of close to 60 million Americans. The Trump administration after winning the November election is in the process of working to fulfill their campaign promises made to the country’s voters. Good people can disagree on how to best protect our nation’s borders and its citizens, and also be mindful of our Christian duty to reach out with love and charity toward those fleeing political and religious persecution. But our political and religious leaders need to recognize that there will be no peace in our nation, and our national culture and discourse will become increasingly fractured and toxic, and at times violent, until we recognize the impact of the abortion Shockwaves unleashed by the Roe V Wade Supreme Court decision of 1973. 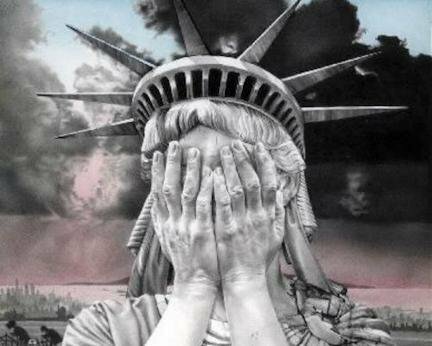 If the Statue of Liberty is weeping, it is because in the great city of New York more African American children die in the womb each year – than are born. That bears repeating – more African American children die in the womb each year in New York City – than are born. There will be no shared “hope and solidarity,” or commitment to American values that Cardinal Cupich hopes for in this country – until we recognize the need to be in absolute solidarity with the unborn child in the womb. Once we understand how abortion has divided and corrupted our nation and its political process, we will see that the most patriotic action we can take right now is to reduce and end abortion. We need to stay focused on the immediate strategies to Defund Planned Parenthood, end all tax-payer funding of abortion, and advance legislation that will reduce abortion. At the same time, the battles for Supreme Court Justices are now underway as we pray and work to get pro-life justices approved. The future of our nation, the health and welfare of our republic and its people, require us to work tirelessly to reduce, and in time end legal abortion in the United States of America. This entry was posted on Wednesday, February 1st, 2017 at 3:46 pm	and is filed under Uncategorized. You can follow any responses to this entry through the RSS 2.0 feed. You can leave a response, or trackback from your own site.